Audrey Day Howard recently celebrated her 9th birthday. In lieu of gifts, Audrey asked for food that was then donated to the food pantry at Immanuel Baptist Church. Audrey is the daughter of Whitney and Jacob Maggard and Eric and Candi Howard. She is the granddaughter of Patty Ross, Paul Dottley and Jimmy and Wanda Howard. 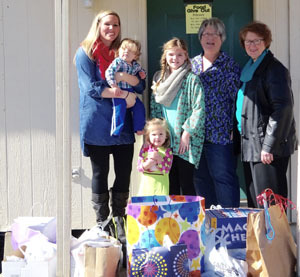 Pictured with Audrey are her mom Whitney, her brother and sister, Bentley and Cruz, and food pantry representatives Linda Caldwell and Nancy Trantham. This entry was posted on Sunday, February 8th, 2015 at 6:29 am	and is filed under Church. You can follow any responses to this entry through the RSS 2.0 feed. You can leave a response, or trackback from your own site. What an amazing thing to do Audrey!! Whitney you truly have some great kiddos! !